High praise, indeed, from an American Expat in the Philippines who spent 57 years in the States, 56 of those in the Midwest, who many times feasted at the premier BBQ pit in Springfield, Illinois, the epic Clay’s Popeye’s BBQ. Jeff and Mary Clay purchased Popeyes’ Bar-Be-Que from Juanita Jones in 1994 following the death of Benson “Popeye” Jones. The sauce recipe is more than 100 years old. Locals still call it the best. The Clay’s have continued to work hard and maintain the reputation in receiving community and civic awards, as did the Jones’ restaurateurs. Popeye’s BBQ was legendary for the smoked ribs they served and it all started with an African American, “Popeye” Jones, a true character who I was privileged to meet before his death. People from the entire region travel to Popeye’s joint to get the best ribs in town. Brothers and Sisters, I’m here to tell you that RACKS in the Philippines, some 7,000 miles from Popeye’s BBQ in Springfield, Illinois, also has some of the best ribs I have ever tasted my entire adult life. Since opening their doors in Makati’s Central Business District in 1992, RACKS has become a household name for famous flame-grilled, falls-off-the-bone ribs. Over two decades later, RACKS continues to deliver the same quality of homey, mouthwatering, all-American dishes that customers just keep coming back for. They serve over 14 outlets in key locations in the Philippines but unfortunately have not landed in Iloilo City, near our home base of Guimaras. It was Saturday night. My wife had finished a 90-minute tattoo session for some new eyebrows. My asawa has been talking about getting tattooed eyebrows for years. When I spied the tattoo sign outside of an outlet at SM Seaside, it didn’t take much convincing to have my wife undergo the process especially since they were having an “eyebrow sale” for 1400 pesos, about 30 US Dollars. The eyebrows turned out great but we were hungry and ready for dinner. I had seen the signage for a new ribs restaurant, RACKS, and we decided to check the place out. The rib joint was packed but we were able to secure a table in about 15 minutes. My wife and I both ordered a half slab of RACKS baby ribs for 480 pesos each and the meal came with two sides. I ordered cole slaw and mashed potatoes. My spouse ordered potato salad and a veggie dish, carrots and corn. A waitress came and took our order. Within a span of five minutes another waitress and a waiter came over to make sure our order had been taken. Talk about service. As a crusty old expat at the age of 64, I’ve never had two food servers approach me to ask if my order had been taken. It didn’t take long for our ribs to arrive. They were falling-off-the bone delicious but we hadn’t been served any of the house BBQ sauce to go with the ribs yet. We were quickly given a bottle of the tasty stuff when I requested it and I slathered it over my half slab of ribs. The sauce was absolutely delicious and simply added to the already heavenly rib dish. I also had to ask for my mashed potatoes and the only negative aspect of our dinner was the fact that my mashed potatoes were cold and my asawa’s potatoes were under-cooked. I advised the manager-on-duty that not only were there ribs the best ribs in town, they were the best ribs in the Philippines and some of the best ribs I ever tasted. I also complimented him on his wait staff which were certainly trained to serve their patrons excellent customer service. I give the outfit 4.5 out of 5 stars. 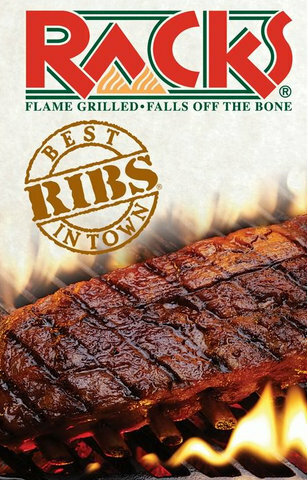 If you’re ever near a RACKS rib joint, I highly recommend a visit. I don’t think you’ll be disappointed. Haven’t been to Kenny’s place for awhile, Derek, but they do have good food. While an operator for Ma Bell back in the States, I had the pleasure of speaking to Kenny Rogers on the phone, he was staying at the best hotel in town, and this was over 35 years ago when operators still operated the switchboards. Extremely nice gentlemen and he spent a few minutes talking to me. I’ve seen Rack’s in Manila, but never eaten there yet. Will have to try next time we go to Manila. The best i’ve tasted were at a English Pub in Paranaque City. The best in the US i’ve tasted was at a place called Rib City in Florida. Really looking forward to a nice steak on the grill when we get to the US. I think Racks is worth a visit, Papa Duck. Is “English Pub” the name of the place in Paranque City? Don’t know that there is one in nearby Iloilo City. I love a good rack of BBQ baby back ribs. And I can confirm that clay’s popeye’s BBQ has some pretty good ribs. But I’ve found that my favorite ribs in Springfield are at Smokey Bones. there baby back BBQ rub ribs are fall off the bone delicious with 4 different sauces at the table for extra goodness. Haven’t been to a Smokey Bones, Roger, but if you like them better than Popeye’s, they have to be some pretty good ribs. Well, Ruby and I are headed to Racks this weekend. I love ribs and have not found a GREAT place in Manila for ribs, but RACKS sounds like the real deal. As far as cold food being served and food not be served together at the proper times, that is just something that most filipinos don’t care about and is something that is going to be hard to change here. So many eat that way at home, so they don’t seem to mind it being done that way in restaurants. We foreigners, we expect certain foods to be served hot and certainly mashed potatos is one of those foods. I think it is always a good idea to let the people know that certain foods should be served hot (or cold for that matter depending on the food) but it is how we say it. If we say it nicely I think it is well taken. Let me know how you like Racks, Todd. We’ve ordered ribs in the Ph several times over the past almost seven years and have always been disappointed. You’re probably right about that cold food culture. Whenever we have a function here, the food is always left out and not always re-heated, unless it’s my dish, of course. I certainly didn’t enjoy the cold mashed potatoes but like I said in the post, the ribs more than made up for them. When I was praising the manager at Racks for the ribs and great customer service, I should have mentioned the cold mashed potatoes. 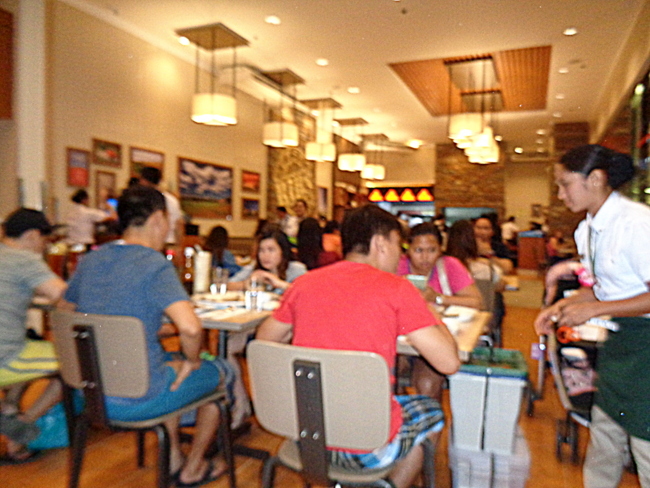 We are going back to Cebu in about 10 days with our niece and nephew and will definitely make another stop at Racks. If I order the mashed potatoes again, I will report back to the manager if the potatoes are cold.